On the banks of the Cam in Cambridge is a rare site a popular outdoor public lido. However, what is less well-known is that Cambridge pioneered swimming pools by developing cold baths, which although developed for medicinal reasons have progressed into recreational uses. A precursor for such baths was a cold bath which had a small arch with Gothic tracery existed in the gardens of John Mortlock on land which was owned by the Austin Friars. As such it may have had an earlier origin but sadly as all evidence of this has now gone. However it is their establishment within the University’s college system which makes Cambridge unique (even rival Oxford could not match this). Five colleges have records of cold baths. Ackermann notes that this site still survived in 1815, noting that: ‘a cold bath is one of the valuable appendages of the place’. It does not appear to have survived beyond this date however. Yet the Cold Bath or Fellow’s Pool still survives in Emmanuel College Fellows’ garden. It was constructed in 1690 and is claimed to be the oldest swimming pool in the country although evidence suggests it may be the following site. Much of the current fabric however is from the 1800s. Its waters were derived from the Hobson conduit, and was often green with algae, some much that a white line was painted on the bottom to help Fellows swim. Yet since the restoration in the 1980s the supply is from the mains. The present changing thatched changing hut dates from the mid-19th century and replaced the previous classical style hut which was constructed about 1745. Although located in the Fellows’ Garden, junior members of the college are permitted to use the pool at certain times. Perhaps the most famed of all such pools, being where Charles Darwin may have swam. Like Emmanuel at one end there is a tri-arched summerhouse and beside the pool are busts of Cudworth, Milton and Saunderson and stone vase in Memory of Joseph Mede. Again until recently, the pool which is fed by Hobson’s conduit, was murky and uninviting and plans were in place to establish it as a duck pond. However, in 2010 it was restored and renamed Malcolm Bowie’s Bathing Pool in honour of the Master of the College from 2002 to 2006. Sadly, again like Emmanuel’s Bath, it is now fed by mains water, but at least like it, it is being used for swimming. In a side development Clark (1886) also notes that when St. Catherine’s Hall was built in 1875, in the cellar of one of the houses a bath was constructed for the use of the undergraduates. Whether this was spring-fed or not is not noted. The cold baths of Christ College and Emmanuel can be observed, although not at close hand in their gardens. To get a closer view find a friendly undergraduate. One of Kent’s oddest monuments can be found hidden in the garden of an ordinary semi-detached house in Bexley. 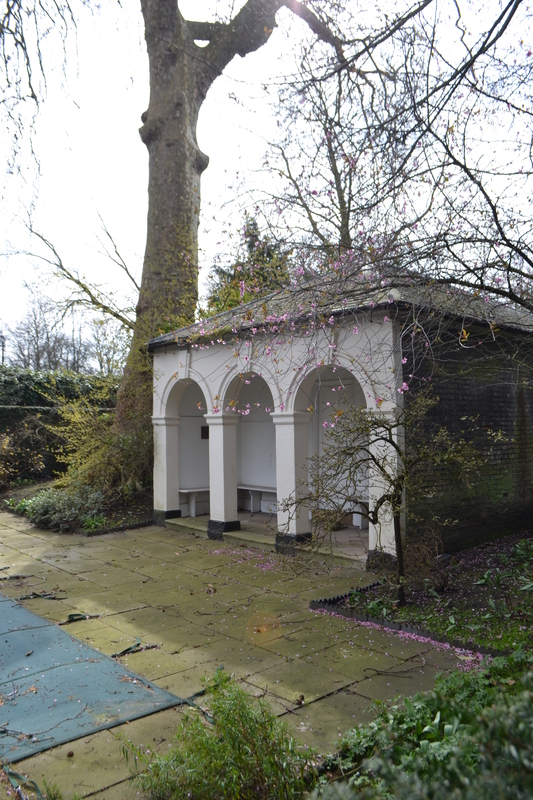 For here, at the end of its garden, one glimpses this unique garden ornament: a gothic bath house. This may not be considered a subject of this site, especially as it is not spring fed, but fed by a river, it nevertheless has an interesting folklore akin to a holy well. The bath house was a feature of the Vale Mascal estate, dominated by the rather modest Georgian house, built in 1740 by Thomas Tash, son of Sir John Tash, an alderman and ex-Lord Mayor of London.As he was marrying the cousin of two local wealthy men, Felix Calvert of Mayplace, Crayford and Sir Richard Calvert of Hall Place Bexley, a fine estate was needed to suit. Consequently the house boasted extension grounds of thirty acres, incorporating the river Cray. Today, sadly the grounds have been reduced, only five acres remaining. This estate was laid out in a formal manner with walks, cascades and small islands. When this was undertaken is uncertain, but it is thought to have been between 1790 and 1775. The first written account of the grounds is by Hasted (1778) which refers to the estate’s beautiful cascade. Later in the 1790s, the Reverend Mr. Henry Hunter writes that this cascade was greatly admired. The Andrews, Dury and Herbert map of 1769 illustrates an extra-ordinary complex of loops and channels of the River Cray within the Vale Mascal Estate. The map shows formal bath ways around a pond, later the spring of Springplace-which was built much later on the ground. It is possible that as the drawing of the bends cannot be reconciled with later maps, the scheme was taking place during the map’s surveying. The grounds extended from Wollett Hall, North Cray, to within a quarter of a mile of the Bexley Mill. Along the stretch of water one encounters their weirs, a cascade and a water wheel to pump ater from the river Cray. Towards the north-east end of the estate there was a boat house, long pulled down, but shown on the 1860 OS map. Its landing steps were rediscovered in the 1960s during vegetation clearance. It is, however, the sturdy bath house which is now the estates most fascinating relic. The building itself is of a Gothic style representing a small chapel, complete with a sham tower, buttressed walls and gothic windows, and indeed bears similarity to a number of countrywide holy wells. It was constructed of thirteen and a half inch brick wall, with an eighteen-inch west wall-thickened to support the extra weight of the tower. The external walls are also flint-faced to a depth of four-and-a-half inches, as the splayed corner buttresses, with flint patterning between the quoins. Inserted into each of the walls are typical period small blocked windows of rubbed brick, with two gothic cinque foiled glazed windows set high to protect the bather’s privacy. Another ‘blind’ window is to be found on the east side, but flint filled. There are neat brick label mouldings above all three windows. The tower, which is flint-faced, is adorned with narrow brickwork slots and lozenge decoration to suggest that it is a belfry. Above the doorway and set into the lower portion of the west side of this tower are lozenge-shaped panels, in the corners opf which one can trace faint inscribed numerals. There were probably once gilded and doubtless record the date when the Reverend Mr, Egerton restored it in the last century. One enters the bath from the west. This doorway once had a substantial heavy oak door, which was removed to Frank’s Hall, Farningham by the former owner of Springplace in 1935 (where it is still there is unclear). The floor of the bath house is nine inches below the door sill, and to the right-hand side is the rectangular cold plunge, entered by a series of steps. Unfortunately one cannot ascertain whether the plunge bath was tiled or brick-lined as it is obscured by silt and mud. The cold plunge is fed by the stream through an arch set low down in the south wall, and empties though the sluice, replaced around forty years ago. Above the sluice are two oak horizontal beams, spanning the building some five feet above the floor. There were erected to support two upright pieces from the original sluice gate, which was two feet further from the north wall than the present one. Interestingly, in the left hand corner there is a small fireplace to warm the bather. Its flue leads up into the mock tower. Theories suggest that the estate may have been landscaped professionally by Capability Brown or a disciple. This has been suggested because of the nature of the river improvements suggests a great skill. Vale Mascal was noted for its creative use of water, utilising sub-streams, cascades and lakes to produce a number of islands. The bath appears to be situated on one of these islands. It is known that Brown was working locally. 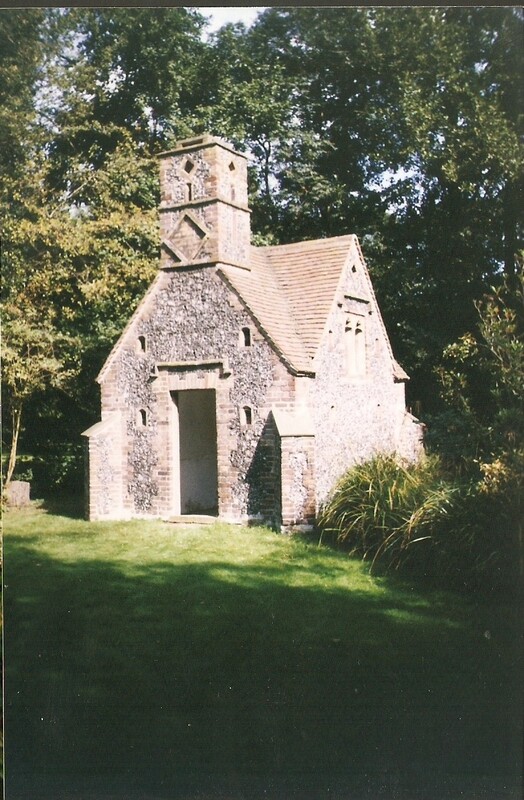 He landscaped North Cray Place in 1792 and Danson in the 1760s, where he built a small cottage in the shape of a chapel called Chapel House, so it is possible. The site has attracted considerable folk tales, some more likely than others. Some antiquarians have suggested a Roman origin, fancifully describing it as a Roman Bath! Other local beliefs are that it was used by St. Paulinus to convert pagans and that it was a path used by pilgrims travelling the routes to and from Canterbury. All these pieces of lore hand upon some pre-eighteenth century origin for this site. Unfortunately there is no evidence for this. A more probable piece of religious lore is that it was used by Charles Wesley during visits to the district. This is better supported by parish records, which refer to a Charles Welsey baptizing by immersion in March 1742. After the suicide of Robert Burdett in 1806, the state began to fall into decay. As a result the land was broken up and portions sold individually. The estate house was taken up by the magistrate for the county, Sir James Charles Lawson. Its final and present fragmentation occurred in 1935, leaving the bath house with its island belonging to the semi-detached house of 112 North Cray Road, now owned by the Yun family. Previous owners, the Reverend Mr Egerton and Robert Cooper, had fortunately carried out any restoration work needed for the house. Despite this, by the twentieth century vegetation had taken control, which although gave the site a rustic appeal, was causing damage to the fabric. This was precipitated in 1987, when on 16th October, the Great Storm struck down an ash tree. This broke through the roof and considerable damage result. This at first was thought to the end for the bath house, repairs being too costly! Fortunately, however money became available from Bexley Council’s Heritage Fund, Mr. Yun’s insurance and English Heritage. In the spring of 1990 restoration was carried out. So this enchanting relic still stands, rather incongruously in a private garden, for the delight of anyone who makes an appointment to see it in the summer months.